Cherry trees are fairly adaptable trees, capable of growing well in a variety of soil types. 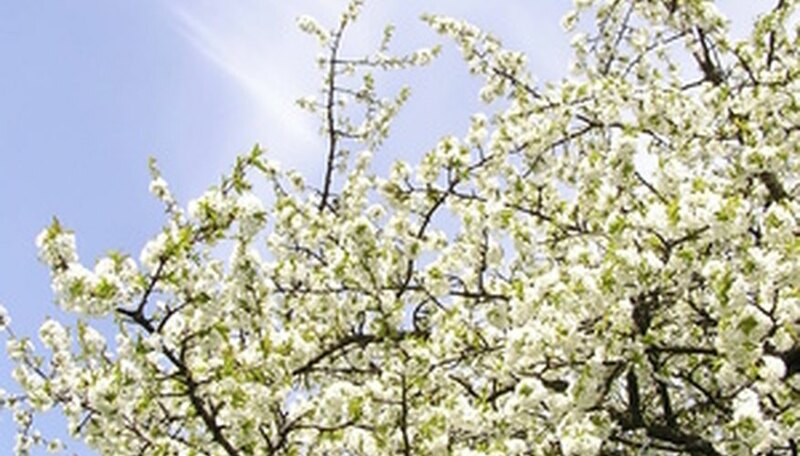 Fertilizer is seldom needed but can still be a benefit to cherry trees. Amending soil to correct deficiencies before planting cherry trees is helpful, as is a carefully monitored and applied fertilizer routine. Fertilizer is defined as any substance such as organic matter or chemical mixtures that make soil more fertile or productive. With that definition in mind, there are many substances that can be considered fertilizers as they enhance the soil and thereby the production of the cherry tree planted therein. Organic fertilizer is something found in nature such as manures, compost and green crops used as cover. Inorganic fertilizers are chemical combinations mixed together in varying quantities depending upon the intended use and desired outcome. Cherry trees are adaptable to most soil types from sand to clay to loam. However, they do best in loam soil because it is a mixture of sand, clay and organic material. If the soil is too compacted and poorly drained such as clay, or loose and nutrient-poor such as sand, lots of organic material such as dried leaves, grass clippings and manures should be worked into the soil. These are added to the site before planting cherry trees. Organic matter can be worked in after planting if care is used not to disturb the roots. Most commercially prepared fertilizers are blends of nitrogen, phosphate and potassium, the macronutrients needed by nearly all plant life. The proportions are displayed as N-P-K formulations to represent the ratio of each chemical in the mix such as 10-10-10 or 12-12-12. Other macronutrients and micronutrients can also be added as fertilizer either individually or as part of the blended fertilizer. Macronutrients could include sulfur, magnesium, and calcium. Micronutrients include manganese, iron, zinc, copper, selenium and a few others. Typically cherry trees need only occasional applications of nitrogenous fertilizer. A soil test from your local extension office before planting and then every three to five years will reveal the nutritional content of the soil as well as the pH value. Unless extreme circumstances exist that could leech nutrients from the soil, the initial soil preparation should be sufficient to maintain the cherry tree’s health for several years, requiring only general fertilizer applications annually. The soil test should be the guide in determining if any additional or specialized applications should be made. If the tree is growing 6 to 15 inches in branch length annually, it is performing well. If not or if foliage is not lush and green, nitrogen is required at the rate of .1 pound per year of age of the tree up to a maximum of 1 pound. Applied in a broad band around the base of the tree but not touching the tree, the fertilizer can do its job without causing fertilizer burn to the cherry tree. Cherry trees can also benefit from an occasional dose of potassium, in which case a blend of 10-10-10 or 12-12-12 should be applied in a like manner. Either application should be given in the spring and repeated as necessary in the fall.